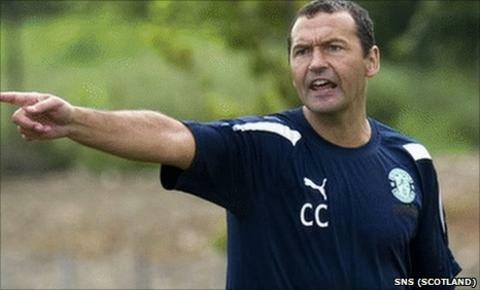 Hibernian manager Colin Calderwood says his future is in the hands of club chairman Rod Petrie. On Tuesday, Nottingham Forest manager Steve McClaren insisted Calderwood was eager to return to his club as assistant manager. But Calderwood insisted that the final say on any move would be up to Petrie. "The situation is, as far as I am aware, there have been a couple of approaches but they haven't been to the satisfaction of the chairman," he said. However, Calderwood did say that he would have an interest in a move, should the clubs reach agreement. "I think there is a level at which it might be different. But, at the minute, it's not. "There's a contract there that you definitely want to honour, unless something changes and everyone comes to an agreement. "At that point, I must admit, there would be some interest. But it all depends on a couple of yeses from the chairman." On Tuesday, Petrie hit out at Calderwood's agent - and warned McClaren that he is in "dangerous territory" with his public comments. Birmingham City manager Chris Hughton is also keen to land the former Scotland international, 46, as his number two, after the pair worked together at Newcastle. "There has been speculation about Colin. We have had some dialogue with Hibs," said Hughton. "Most people know my feelings on Colin. I brought him to Newcastle and he is someone I've known and worked with for a long time." McClaren, though, told the BBC that Forest is the "only place he wants to come". Speaking to Radio Nottingham, McClaren said that agreeing a deal with Hibs is the only thing preventing a return to the Reds. Petrie was frustrated with what he suggested was pressure being placed on the club's manager - and warned off former England manager McClaren while reiterating his desire to keep Calderwood in Leith. "McClaren's words were probably spoken not by him but by his agent [Colin Gordon]," he told his club website. "The same agent who represents Colin Calderwood. "Nottingham Forest know that their only official approach to Hibernian - a phone call on Friday 24 June - was rejected. McClaren had said: "We are trying to negotiate with Hibs, but they do not want to lose him." He is confident that Calderwood would return to Forest despite being sacked as their boss in December 2008. "We just have to be a little bit more patient and hope that Hibs will talk and negotiate and get Colin where he wants to be," said McClaren. "There is a lot of competition for Colin, but there is a willingness on every side to do it."